Tekmar Group (AIM: TGP), a market-leading technology provider of protection systems for subsea cable, umbilical and flexible pipes and offshore engineering services, announces its half year results for the six months ended 30 September 2018 (HY19). “We were delighted with the success of the IPO in June 2018 and in many ways, the business has never been in a better position. 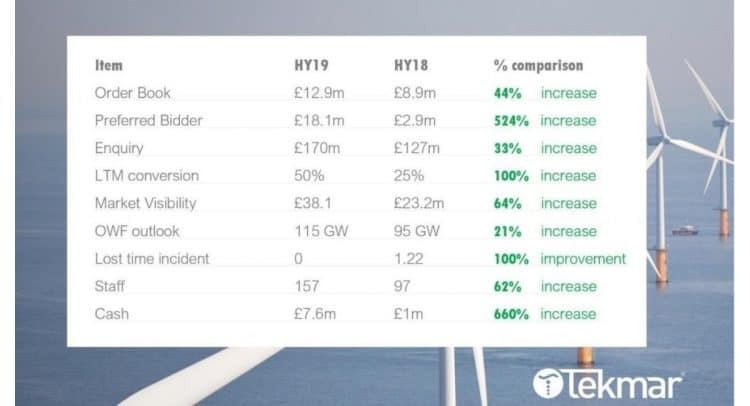 We have extremely strong forward market visibility; Tekmar Energy is maintaining its unrivalled market share in our core market, Offshore Wind, having won every European array project awarded during the period; and Subsea Innovation, our first acquisition since IPO, delivered a solid performance. “Contracting activity has increased during the period and the Group has a record Order Book of £12.9m. There has however, been a delay in the award of higher margin TekLink® offshore wind contracts, on which we have Preferred Bidder status. Our customers have changed lead times from order placement to delivery by up to six months, deferring the signing of contracts by a similar period. 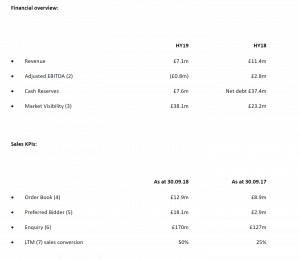 We have also experienced increased volume in smaller, lower margin, contracts in HY19. Within the period, approximately 38% of sales were from TekLink® Cable Protection Systems and 62% from other products, which have a lower gross margin. As a consequence, the Group is expecting to generate record revenues in FY19, ahead of current market expectations. However, due to the change in margin relating to product mix, the Board now expects profit for FY19 to be closer to that achieved in FY18. It is important to note that this impact on FY19 profit is purely a timing issue, which will be partially mitigated by profits generated by newly acquired Subsea Innovation.